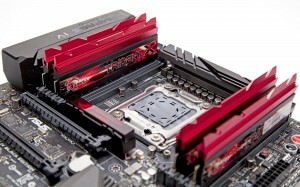 G.Skill is still reaching for the skies when it comes to memory frequency. 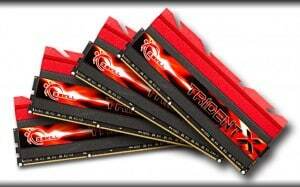 This time they’ve managed to hit a very impressive DDR3-4072 using four TridentX sticks. Here’s the press release. 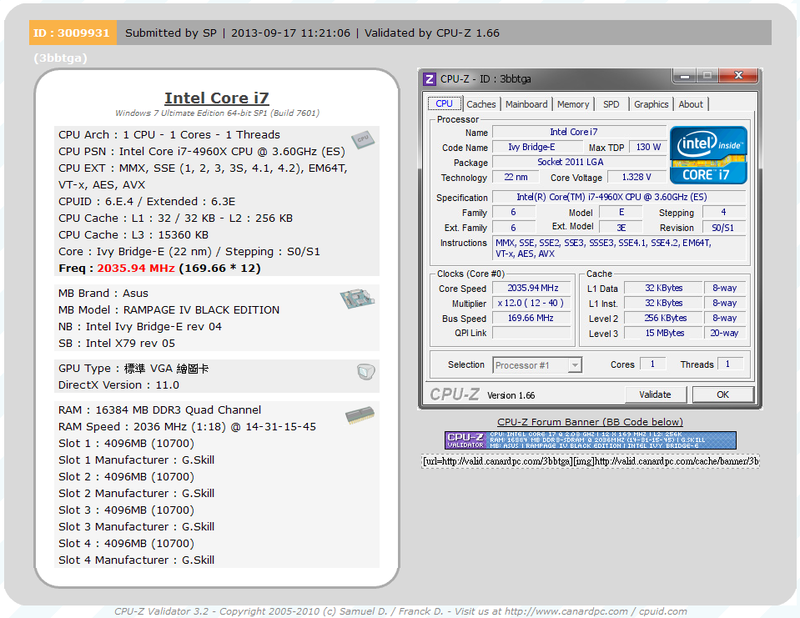 Taipei, Taiwan – 18 September 2013 – No limit is too high for G.SKILL memory. 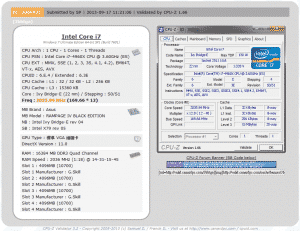 In just a week after the official release of the new Intel Ivy Bridge-E Core i7 Extreme processors, G.SKILL memory is already testing the extreme limits of the Intel processors and broke the world record for fastest DDR3 yet again. This time a 16GB (4x4GB) G.SKILL TridentX memory kit is overclocked to a blistering DD3 4072MHz – the first instance of a quad-channel DDR3 memory kit to break the 4GHz barrier! This astounding feat was made possible and achieved on the new Intel i7-4960X CPU and the ASUS Rampage IV Black Edition motherboard under LN2 extreme cooling. Established in 1989 by computer hardware enthusiasts, G.SKILL is a leading memory & Solid State Drive manufacturer based in Taipei, Taiwan. The company’s top priority is quality. All of the products undergo a series of the most rigorous tests and strict quality control processes. In addition to a committed, qualified IC testing house to examine the products, all G.SKILL products are 100% tested to ensure the highest yield, reliability and quality. Impressive feat, that’s for sure. I haven’t hidden my disdain for high frequency, lower performance memory and its horrible price-for-performance ratio but the overclocker in me is still impressed with this kind of feat. This isn’t one stick of binned memory getting a validation – this is in quad channel, which is immensely more difficult. Well done G.Skill. In addition to that, G.Skill is holding a big gaming hardware giveaway on Facebook. 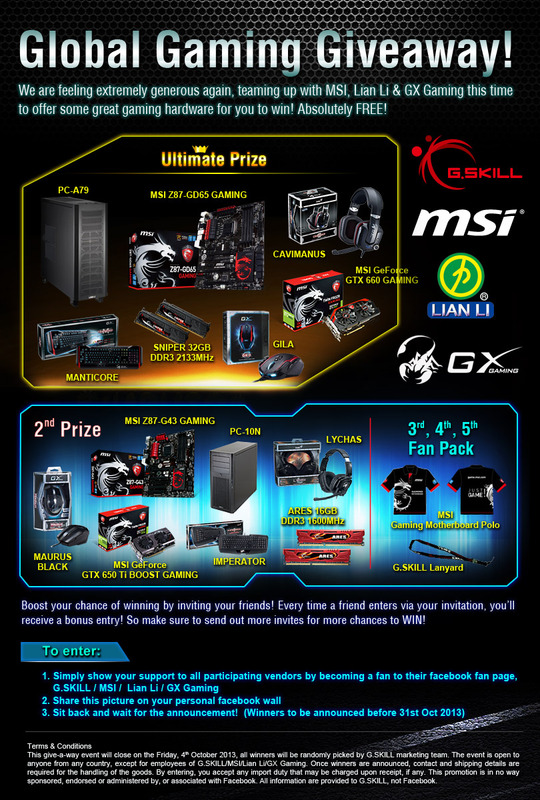 G.SKILL Hosts Global Gaming Giveaway! World’s leading high-performance memory designer and manufacturer, teamed up with MSI, Lian Li & GX-Gaming, offering great gaming hardware to facebook fans! There are also swag packs for 3rd, 4th and 5th places which include MSI Gaming Motherboard Polo & G.SKILL Lanyard! Boost your chance of winning by inviting your friends! Every time a friend enters via your invitation, you’ll receive a bonus entry! So make sure to send out more invites for more chances to WIN! 4. This is a global giveaway event with no restrictions! Anyone can enter! 5. Sit back and wait for the announcement! So go sign up to try and win some of those sweet prizes from G.Skill, MSI, GX Gaming & Lian Li!